The Solo Cook blog is for men too. Hey, bachelors I know there are nights when cooking seems more like a chore than something to enjoy. But trust me, cooking for yourself is fun. This blog is for anyone who wants to cook for himself or herself. You also don’t have to be “single” to try these recipes and swing by the “hot spot” restaurants that I recommend. If you are dating someone, but have to fend for yourself because you aren’t shacking up – this is the recipe for you. If your partner or roommate is traveling out-of-town and the kitchen seems as foreign as a faraway country – this is the recipe for you. If you are single and want a dinner that will be ready within minutes – this is the recipe for you. The first order of business when you get home from work is to fill a pot with water and put it on high heat so that it will boil soon. And before you take off that tie or dress, pour yourself a drink. It doesn’t take much for me to get in the mood to cook. A glass of wine and some funky music playing in the background always gets me into a food vibe. And if you are into a non-alcoholic drink – grab a sparkling water and squeeze or slice some fresh fruit into the glass. Next chop up all your ingredients – garlic, mushrooms and zucchini. Yep, that’s the only three ingredients that you have to cut. You can use any vegetable you want, like broccoli or Swiss chard. I used the green leafy tops of beets from the garden to make this pasta dish. And if you are like me and you crave protein – don’t be afraid to add shrimp or chicken if it’s in the refrigerator. The key to this dish is that it’s easy and fast. Heat oil and butter in sauté pan on medium high heat. Add garlic, mushrooms, white wine, salt and pepper, and cook for several minutes or until liquid evaporates. Put angel hair pasta in salted, boiling water for five minutes. Add zucchini or vegetable of choice, to the sauté pan and cook until zucchini starts to brown, then sprinkle Parmesan on top. Drain pasta, and drizzle with olive oil to prevent it from sticking. 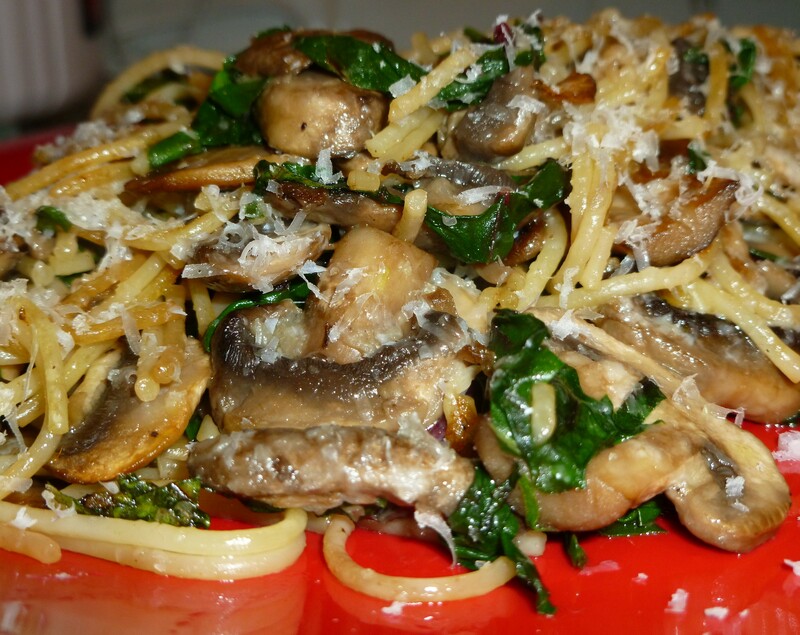 Add the sautéed vegetables to a mound of pasta on your plate and enjoy. Posted in Recipes and tagged bachelor, dinner, easy, garlic, mushrooms, pasta, quick, recipe, zucchini. Bookmark the permalink.